Dinner for four on a Saturday evening at a very classy BYOB on the Main Line. My friends Gerry and John and I had just visited Sola a few weeks ago and we were impressed enough that Gerry and I were returning with our wives for a 5:30 P.M. reservation. It wasn’t very crowded when we arrived but the tiny dining room quickly filled as the evening progressed. 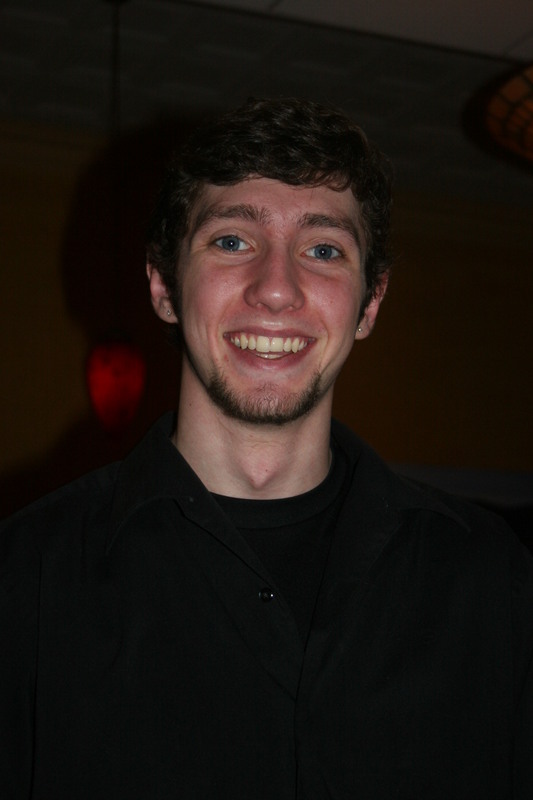 Our server from our previous visit ( Marie) remembered us but on this evening we had Tom taking care of us. Tom proved to be equally capable and he did a nice job all evening being attentive to our needs, which almost always requires additional wine glasses. Sola, by the way, features nice stems and charges a $2.00 corkage fee per bottle, which is certainly reasonable and I thought I read somewhere that the money is donated to a local charity. Speaking of wines, we had some good ones with us. 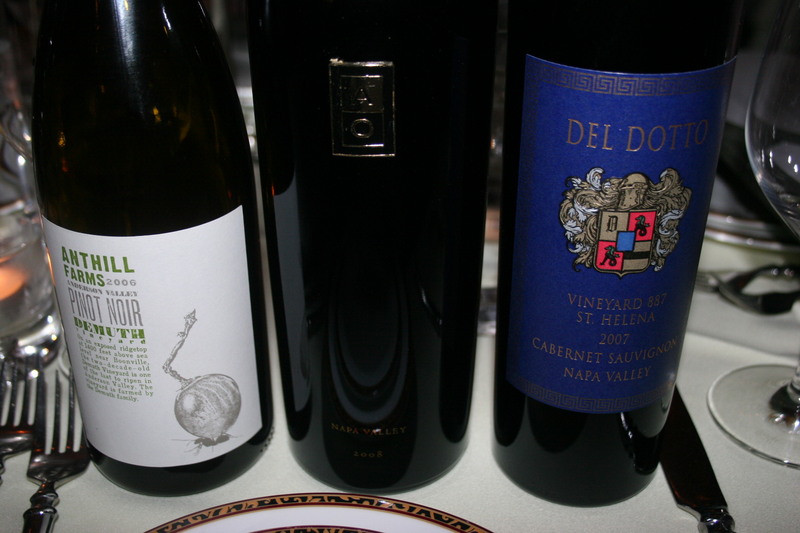 Gerry had brought two of our recent Napa trip favorites. The 2007 Del Dotto, Vineyard 887, Cabernet Sauvignon. This was the special blend that Del Dotto had created for a Las Vegas party hosted by Donald Trump. 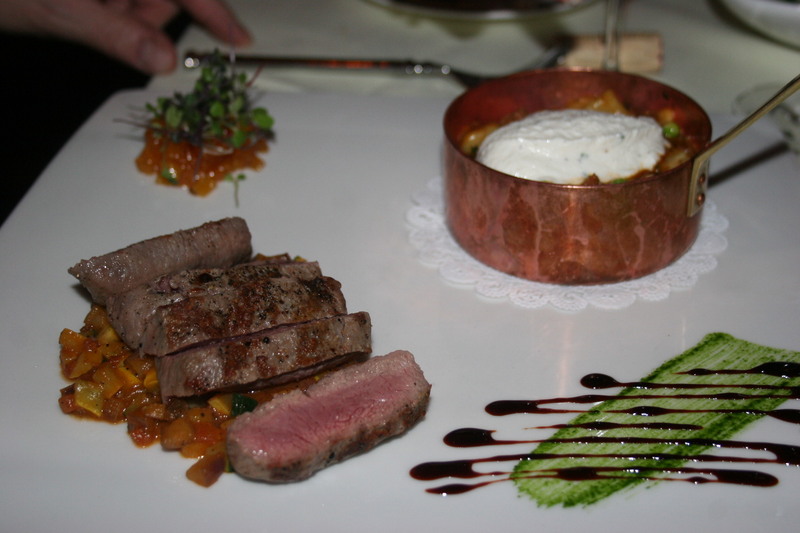 We liked it when we sampled it at the Del Dotto caves in Napa and it was just as good with dinner at Sola. Gerry also had another bottle of the monster wine in the monster bottle, the 2008 Alpha-Omega Era. This ia A-O’s top of the line offering and even though we could easily be accused of infanticide for popping these so early it’s actually hard to believe they will actually be better in years to come. I went lighter just in case we had some dishes that cried out for something slightly less hearty and went with an excellent 2006 Antill Farms, Demuth Vineyard, Pinot Noir. The light strawberry and floral notes were perfect with several of our items. One of the highlights of Sola is their food presentation and it was evident in virtually all of our dishes. 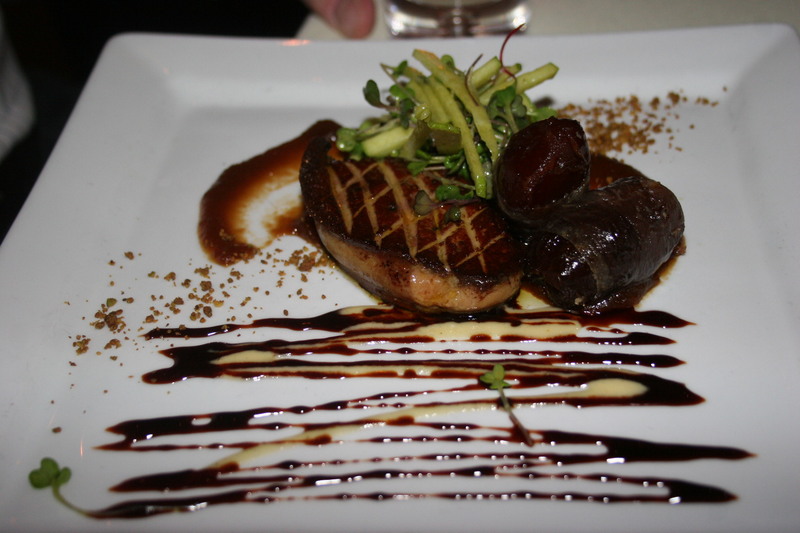 Gerry began his meal with the Pan Seared Foie Gras, medjool date wrapped in cured duck prosciutto, apple butter, toasted pistachio and port reduction. He loved it. 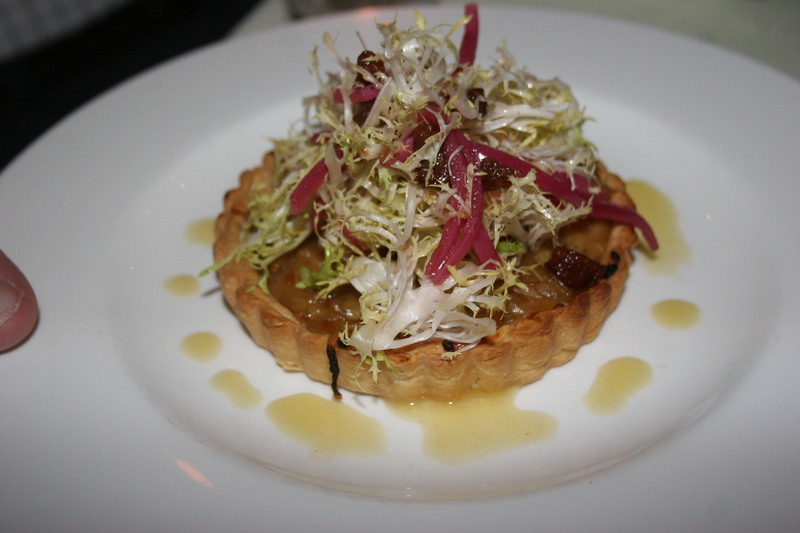 His wife, Joann, chose the Carmelized Onion & Gruyere Cheese Tart, baby frizee, pancetta lardons, aged Jerz-hazelnut vinaigrette. She really enjoyed this appetizer and raved about the flavors. Nobody can make something sound better than Joann does when she gives compliments. My wife, Kathy, went the simple route and selected the Sola Chop Salad, cucumber, avocado, tomato, blue cheese, bacon and Fuji apple with petite mixed greens in a honey Dijon vinaigrette. 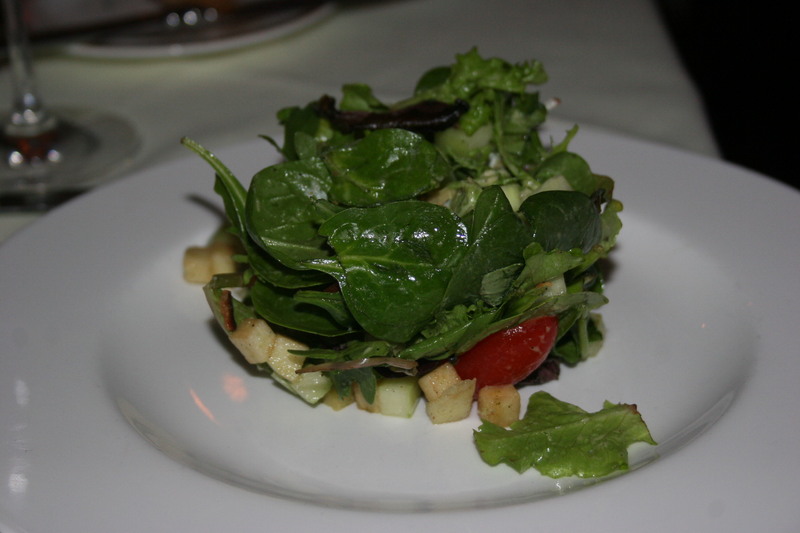 Even this not-so-simple salad was beautifully presented and Kathy was quite pleased with the start to her meal. 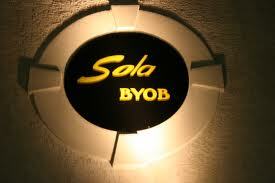 Only I was slightly disappointed with my appetizer and it was certainly not Sola’s fault. For some silly reason, I decided that I wanted one of the “specials” as my opening treat. 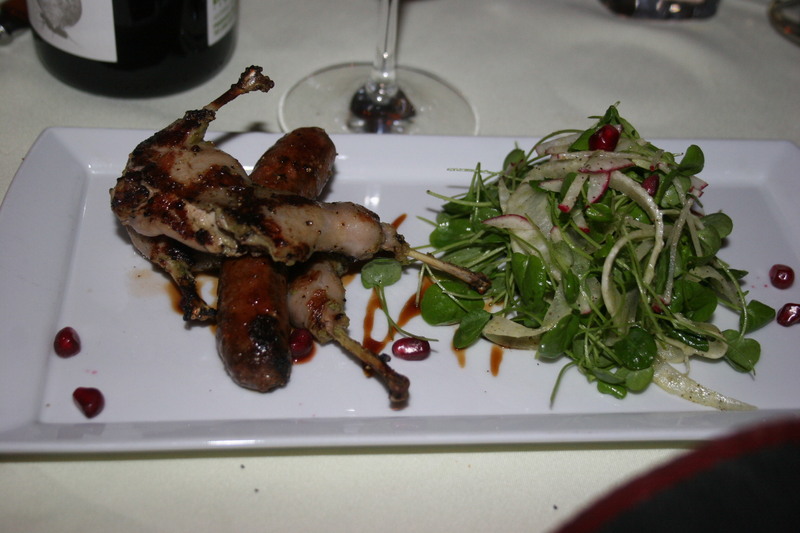 I chose the Quail with sausage and field greens. I should have thought it out more but obviously, I am not a quail guy. I don’t care for several foods that, in my estimation, require too much work for too little food. We can now add quail to that list. I might add that the sausage was good and what little meat I inefficiently pulled from the bone wasn’t bad. Just not the right choice for me. I fared much better with my entree, the Seared Diver Sea Scallops, carmelized salsify golden raisins, Meyer lemon, Israeli cous-cous, with a smoked tomato butter, pine nuts and shaved botarga. 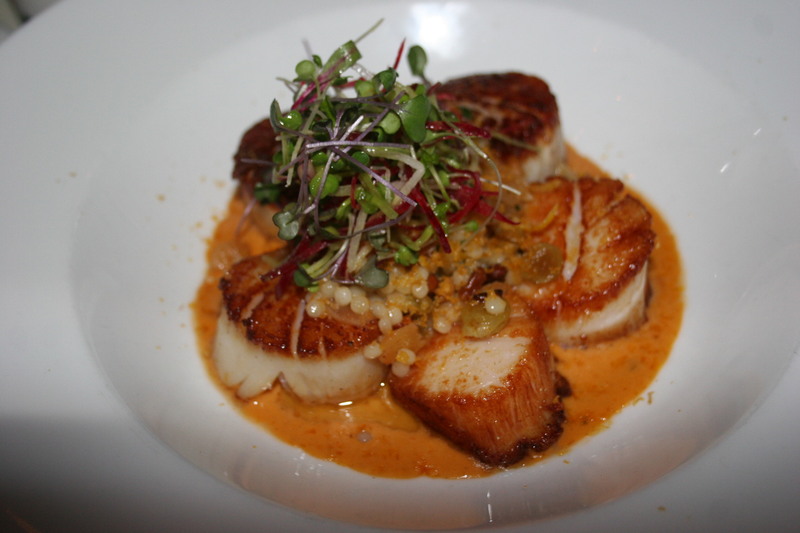 Beautifully presented, the sauce was wonderful, and the scallops perfectly done. Just a real first-class dish that shows off the obvious skills of the chef. Gerry, showing no imagination at all, except for a passionate love of good lamb, selected the same entree he had when we first visited Sola a few weeks ago, the Australian Lamb Two Wats. braised shoulder, hand-made gnocchi, English peas, ricotta, grilled loin-ratatouille and maple chutney. Gerry was raving about the dish before it even arrived at the table and continued with each bite. No doubt this is one of his favorite dining spots. The ladies both chose an entree that I was giving serious consideration before I settled on the scallops. 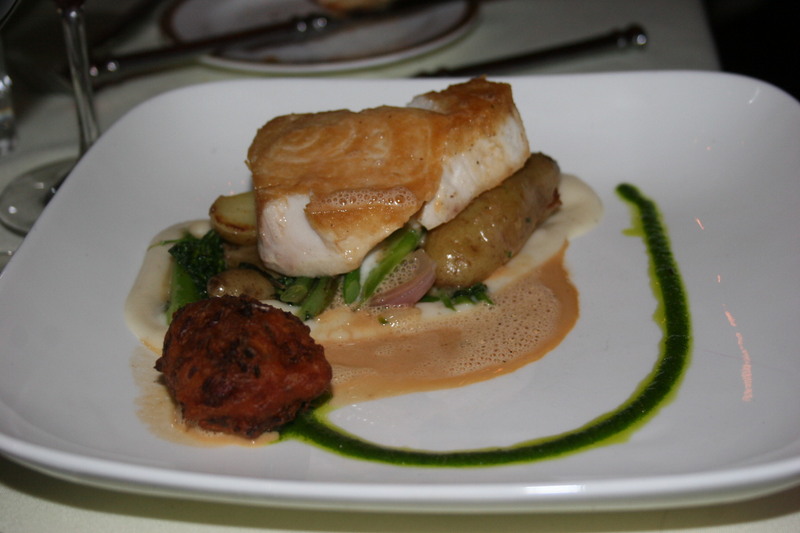 They ordered the Hawaiian Butterfish, Jerusalem artichoke puree, fingerling potatoes, lobster fritter in a lobster reduction sauce. Kathy gave me some of hers and I agreed with both of them that the fish was delicious and everything on the plate worked well with each other. Each of us was thrilled with their entrees and the wines were just an extra plus to this great meal. 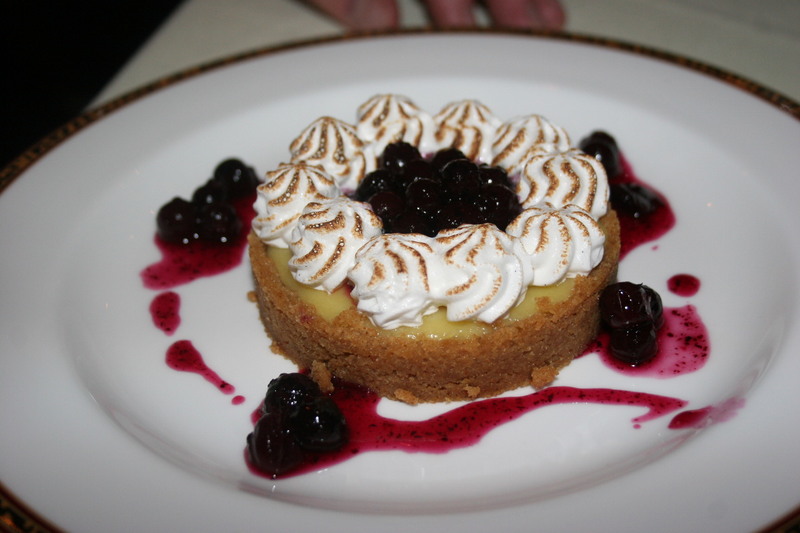 We each finished off our meal with a different dessert, Gerry chose the Individual Key Lime Tart, graham cracker crust, meringue and gingered blueberries. 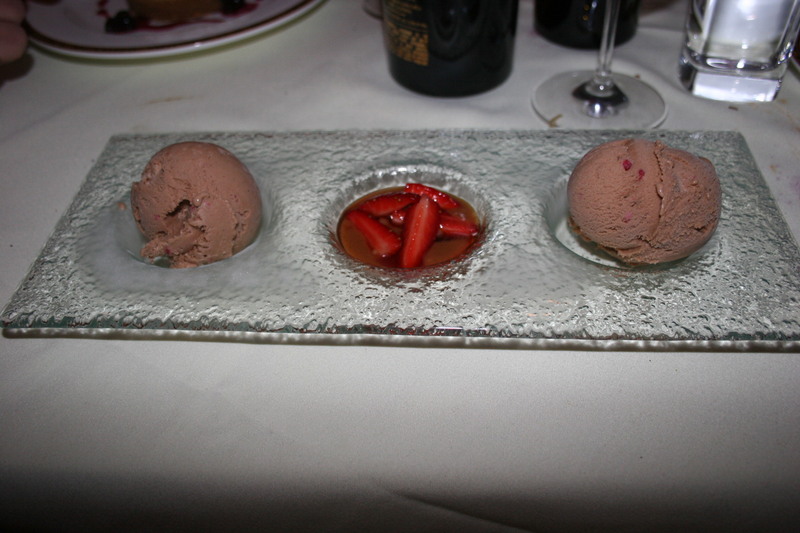 I had the Chocolate Gelato with strawberries and a caramel dipping sauce. Perfect ending, in my opinion. 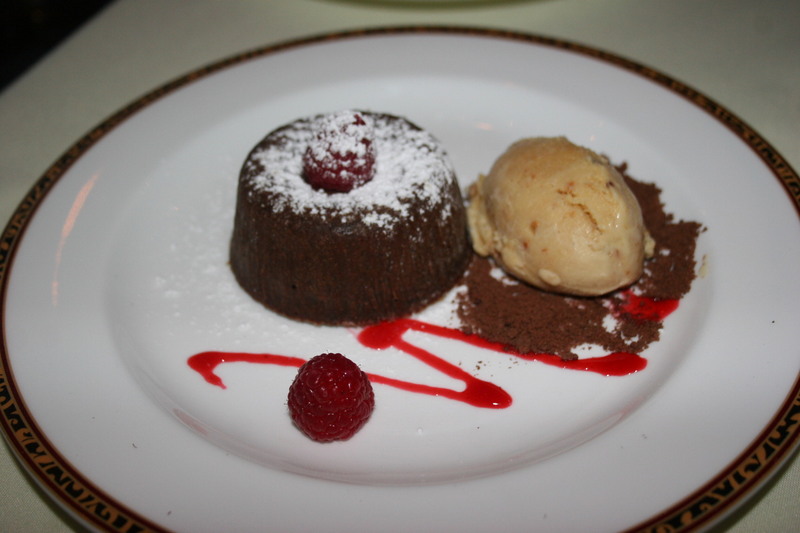 Joann finished with the Warm Chocolate Gateau, malted milk ice cream and raspberry coulis. What’s not to like about that?? Another nice presentation. 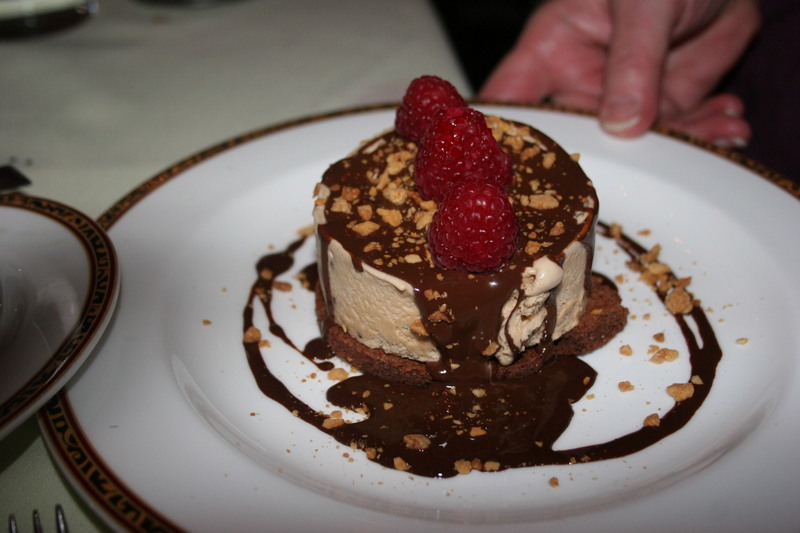 Last, but not least, Kathy ended her meal with the Frozen White Chocolate Hazelnut Mousse, dark chocolate cake, Valrhona chocolate ganache. Another great meal with great friends and great wine in a great atmosphere.